I was on hand in Germany this week at the 2013 Motor Show and snapped these photos of the all-new Infiniti Q30 Concept. 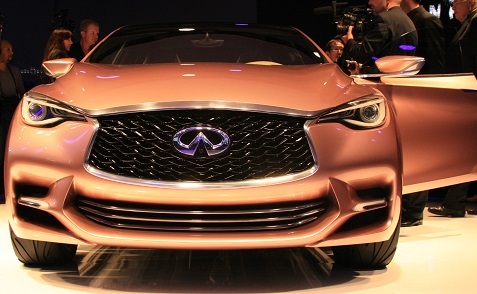 Expectations are that this new concept car will be very close to the compact CUV that Infiniti will ultimately release. The gold color really grabs your attention and the reveal came across as a big hit. The front end is very similar to the current design language we’re seeing from Infiniti, but the back end really stood out with the back window blending into the rear tail lights. The effect was very impressive. I got shots from all angles so you can get a feel for the vehicle. The compact CUV market is very hot right now and the luxury brands are trying to grab their share as well, so it will be interesting to see how quickly Infiniti can get to a production model here. The design of the Q30 is intended to create “a unique blend of features reminiscing of a coupe, a hatch and a crossover.” It definitely inspires a sporty vibe that should grab the attention of buyers looking for luxury and fun in their driving experience. During the press conference de Nysschen was joined on stage by Sebastian Vettel, a 3-time Formula One world champion who has been assisting the company. He was presented with a special helmet to use in testing engineering prototypes of the future compact premium model, the first Infiniti model that he will have a role in influencing from its inception.